Mak Kimchee (salad style) is made for everyday meals. It’s widely sold in Asian markets in 16 oz containers. Pogi Kimchee is for fine dining. Kimchee Is a semi-raw fermented food from Korea. It’s spicy and pungent with a flavor that pairs well with so many other foods—rich in vitamins, minerals and beneficial microbes. Authentic Korean kimchee is not a vegetarian food. It’s typically fermented with fish sauce or shellfish paste, and in some, animal stock. If you have any dietary concerns in general, it’s best that you learn to make your own. The key to vegan kimchee is in the chili paste, or gochuchang in Korean. These instructions are for home-fermenting mak kimchee, the type that’s widely sold in Asian grocery stores, and gochuchang. 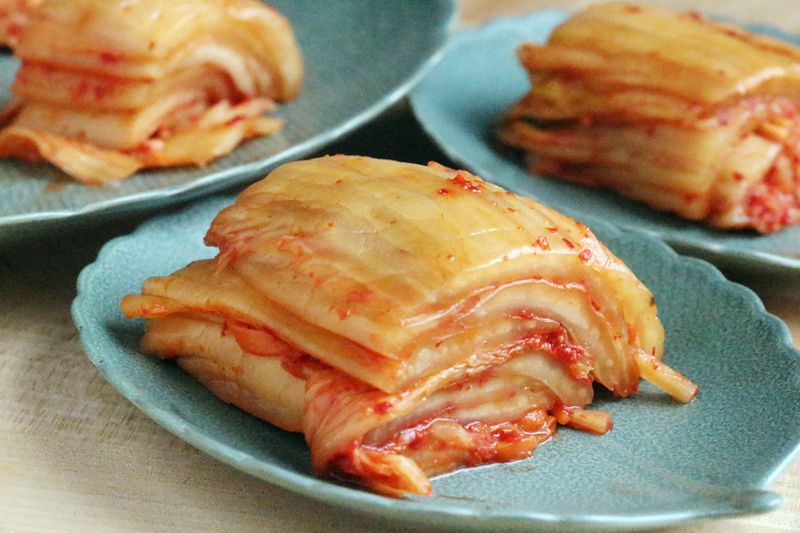 Mak kimchee (top image) is made in the same way as whole-head or pogi kimchee (above left) except that the Napa cabbage is cut into bite-size pieces before fermenting. Mak kimchee is intended for casual meals. Making your own kimchee is not that difficult but it does take time, ideally a free weekend. To learn how to make your own vegan gochuchang, Click Here. Select a medium size cabbage that is firm and free of damage. Remove the tough outer leaves and save a few to make a “leaf cap” that you will use later. With a sharp knife cut off the tough fibrous base and discard. Cut cabbage into quarter sections and from each section pull out the heart. Slice the larger outer sections vertically in half. Cut everything into pieces that are about than 1 1/2 inches long. Place cabbage into a large colander, rinse well under the tap and drain well. Place cabbage into a large nonreactive container (stainless steel bowl, Pyrex dish, etc.) and rub thoroughly with a 1/2 cup of sea salt. Let it rest for four to six hours until most of the liquid is released, then drain well and discard the liquid. Make a brine with two gallons of water and one cup of sea salt. Brine the cabbage for 8 to 12 hours. This salt process conditions the cabbage for fermentation. Prepare the other ingredients: Slice the carrots and Korean radish into julienned pieces (fine matchsticks) that are roughly 1 1/2 inches in length. Cut scallions into 1 inch pieces and break them apart by rubbing them with your hands. Drain cabbage and reserve 1 cup of brine. Return cabbage to the nonreactive container with the other ingredients add 1/2 cup of brine. Add Korean chili paste and coat everything well with your hands. Wear food-grade disposable gloves as a precaution, or you might to be caught red-handed in public. Pack everything into clean mason jars. A wide canning funnel makes this task easier. Leave at least 1 1/2 inches of air space from the top of the jar. Fold and make a leaf cap with one of the large outer leaves you set aside earlier and place it over the contents of the jar. Carefully tamp contents down with a wooden spoon or a small bean masher to remove most of the air pockets. Add enough brine to leave 1 1/2 inches of air space from the top of the jar. This prevent contents from overflowing during fermentation as CO2 is released. Clean the lip of the jar and screw the lid on loosely. First fermentation: Set the jar aside at room temperature (65 to 72°F) on a clean surface in a well ventilated place (the garage, on the kitchen counter, etc.) for two but no more than four days. Longer the fermentation creates an acid pH. Taste daily, it should be as tart as a lemon. If the jar over flows at this stage, tamp the contents down, clean the jar’s lip and exterior and replace the lid. Second fermentation: Screw the cap on tightly and refrigerate (38-41°F). Refrigeration slows down acidification allowing CO2 gas and osmosis to create a deep savory flavor. Your tangy fresh kimchee is ready in two to three weeks. It will develop more complex flavors in four weeks. Kimchee will store refrigerated for up to eight months but will take on a sharper flavor. Refrigerate your jar of kimchee after each serving. And there you have it, home-fermented kimchee. Traditional Korean chili paste (gochuchang) and kimchee are not a vegetarian foods. Both are typically made with fermented fish sauce or other animals products. Gochuchang is essential for preparing Korean cuisine and making kimchee. There is no substitute for Korean chili flakes (gochucaru). It has a unique smokey aroma with sweet grassy high notes that bloom with fermentation. You can purchase dried gochucaru in most Asian markets or online. Use fresh ingredients only; don’t use powdered garlic or ginger. These instructions are for making vegan gochuchang using the amino acids found in dried shiitake mushrooms and red miso. A source of protein and amino acid is essential to making this chili paste. The flavor is not as deep as the traditional gochuchang, but it’s clean and tangy with a long lasting savory taste. This recipe yields approximately 4 cups. 1. Grind dried shiitake mushrooms in a coffee grinder to make a powder. Measure out 4 tbsp. 2. Toast sesame seeds in a pan on low heat and set aside to cool. 3. Peel and dice ginger, garlic, radish, pear (or apple) and onion to measure and puree in a blender with soy sauce, orange zest (optional), red miso and warm water. 4. Put Korean chili flakes, shiitake mushroom powder, sugar, sea salt and toasted sesame seeds into a large bowl and mix until all dried ingredients are well incorporated. Add puree and mix with a rubber spatula until you have a paste that is smooth and evenly blended. 5. Transfer to jars and cover. Allow gochuchang to rest for two hours at room temperature and store refrigerated (41°F). Refrigerator after each serving. Make sure that your container is sealed well to prevent influencing other foods such as butter and milk. Gochucaru will develop a deeper flavor if allowed to ferment at room temperature. If you prefer a fermented flavor, cover the mixing bowl with a dish cloth and leave in a clean open area for two to three days. Stir once a day to ensure even fermentation then store refrigerated in an airtight container. Gochuchang will store well for up to four months if kept refrigerated. Over a longer period of time it will become sour and grainy. Sounds delicious! Do you sell the paste?